I have never use SpaRitual nail polish before, but after hearing the buzz about the polish Sacred Ground, I had to give it a try. I am not normally a gray type girl, but figured with a cool name like Sacred Ground I had nothing to lose. So after a decent sale, I decided to finally get this popular polish. The Application: Sacred Ground had a nice consistency and was very easy to work with which is always a plus. It took two coats for it to become completely opaque. The bottle was a little odd to work with as I like to hold onto the bottle while I paint my less dominant hand but couldn’t with the SpaRitual polish. No biggie, it’s good for your brain to mix things up every once in a while. 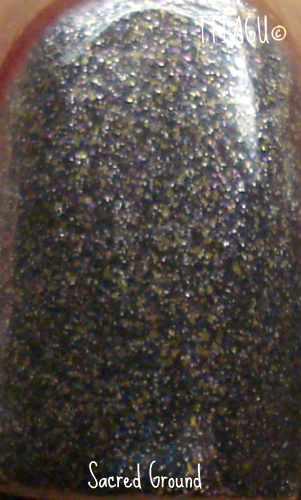 The Color: Sacred Ground is a multidimensional medium gray polish with flecks of multicolor glimmer of different shapes and sizes. The colors of the glimmer include light gray, gold, and pink. You can’t really see the flecks unless you’re looking at the polish up close and personal, so from a distance, it pretty looks much like any medium standard gray polish. 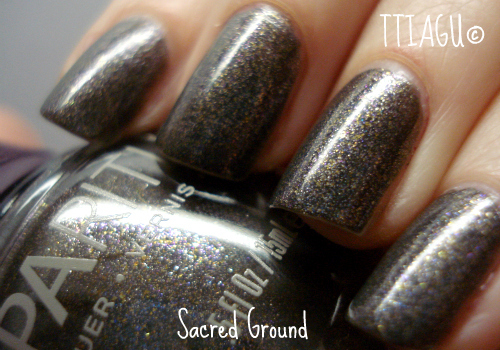 The Verdict: Sacred Ground is a unique idea for a gray polish, but unless you are looking at it up close, it doesn’t really stand out. I won’t lie. 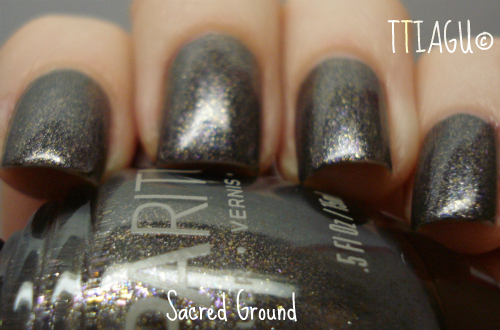 Part of it may be that I am not a huge fan of gray polish and was hoping that SpaRitual would change my mind. But if you like grays with a little kick this may be the polish for you. The formula is great, the lasting power was fantastic (six days without a chip) and the multicolored glitter is a nice touch.